My first two days went well, so I thought I’d share. Plus, if you happen to be another geometry teacher, I need your help with something (I’ll get to that later). 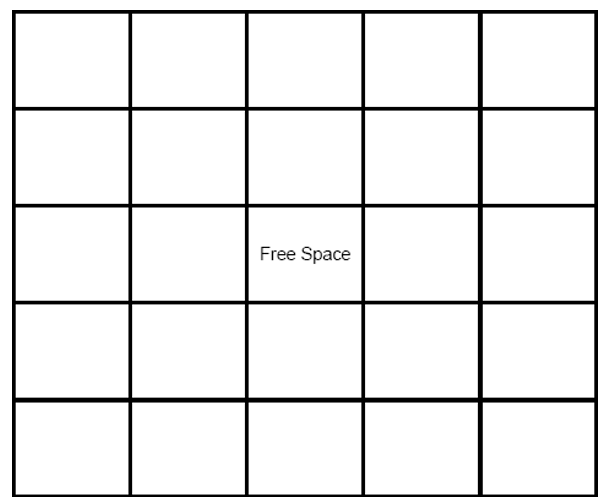 As students come in I gave them a bingo card, with the instruction to fill the integers 1-24 in random positions. Then we play syllabus bingo. I have to get out a lot of facts to start, and it’s kind of dull and students don’t totally pay attention, so I have the beeping and flashing of lights and some Jolly Ranchers for the students who say BINGO. There is a disadvantage to the random order, but it turns out not too bad, and if something seems awry I can always go off sequence to fill in details. That takes up about half the period. Then it’s time for Counterexamples. As students came in I had them pick six pieces of paper of their favorite color (off a table in the back). This time I encouraged them to use their vocabulary to help things out (students referred to their newly-made glossary as the activity was happening). It went better than the first time. I didn’t do any notational specifics (ray AB having a line with an arrow over it, etc.) but those details will hit on day 3. By the time round 2 of the game was done everyone had finished their vocabulary books, so I did some more hot potato and had people share their definitions. Understanding was key. In one case a person didn’t know what the definition they wrote down meant (for “plane”) so we worked through an interpretation. I told them we were going to play the game one more time, but we as a class were going to draw a picture then describe it by writing a paragraph down. A volunteer came and did the drawing and everyone did the writing, and I told them I was going to solicit help from the fine teachers that I happen to know in other states and even other countries and send their descriptions and try to have those teachers get their geometry classes to draw a copy based solely on those descriptions. Yes, I mean you guys. Do you teach geometry? Could I use your class? Pretty please? Comment below or email me (see “About”) and I will hook you up. It will be fun! The write-up was the closer, and classes did have a few spare minutes, so I showed the Hendo Hoverboard. Engineering! 1965 also saw the launch of the Head Start Program, designed to provide early childhood education to low income children while involving the parents. The program was designed to promote the growth and development of parents and their children. The Planning Committee for Head Start felt that children would benefit from their parents’ direct involvement in the program. They agreed that the best way for parents to learn about child development was by participating with their children in the daily activities of the program. Although parent involvement was written into law in 1967, their role in governance was spelled out for the first time in 1970 through Part B in the Head Start Policy Manual. This policy was also known as 70.2. Policy 70.2 defined the responsibilities of Policy Councils at the program, delegate, and agency levels. At that time, many Head Start grantees—especially those in public school settings—called Washington, DC and threatened to leave Head Start because 70.2 gave so much authority to parents. This point is important for what’s to come. In 1967, Congress authorized funds to expand Head Start under a program called Follow Through. In other words, Congress approved a service program which had to be cut down due to lack of funds to an experimental program. The sponsors had classrooms spread throughout the entire country implementing curriculum as they saw fit. Note that this was not a case of them putting in their colleagues; teachers were chosen from sites and given their curriculum via trainers or handbooks. Other teachers taught “comparison groups” not using the interventions that were chosen to be as similar as possible to the experimental groups. 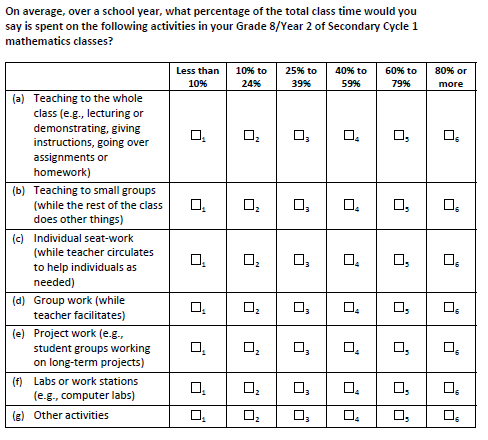 The idea was to see if students using the sponsor’s curriculum would outperform the comparison groups. New Follow Through teachers sometimes resisted changing their teaching strategies to fit the Follow Through models, and they found support for their resistance among others who felt as powerless and as buffeted as they. A wide swath of measures was chosen to assess quality. Notice the number that says “Sponsor” — those are questions submitted by the sponsors, knowing the possibility of a mismatch between the curriculum learned and the curriculum tested. Not all of the data above was used in the final data analysis. By the end of the experiment the main academic measure was the Metropolitan Achievement Test Form F Fourth Edition. 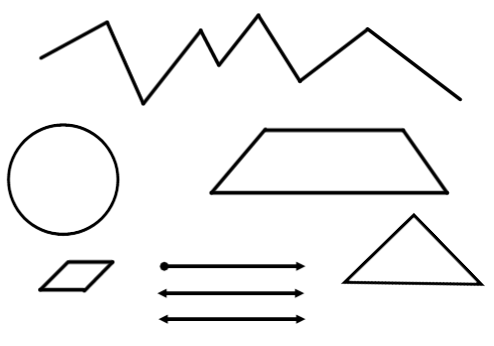 Note the only minor use of the MAT in the chart above representing the early years (noted by SAT/MAT — MAT and Stanford word problems were mixed together). Sponsor questions, for instance, dropped by the wayside. 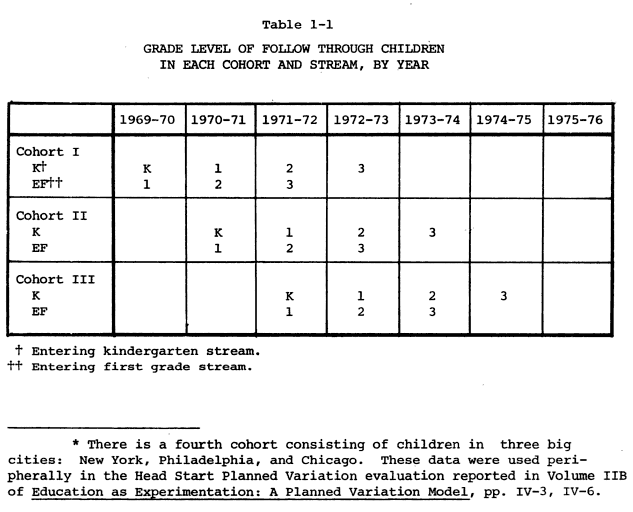 In 1976 the program ended and the program as a whole was analyzed — 352,000 Follow through and comparison children — resulting in a report from 1977 called Education as Experimentation: A Planned Variation Model. “Basic skills” represents straightforward reading and arithmetic, “cognitive skills” represent complex problem solving, and “affective skills” dealing with feelings and emotional areas. The report makes some attempt to combine the data, but the different programs are so wildly dissimilar I don’t see any validity to the attempt. I’d first like to focus on five of them: SEDL, Parent Education, Mathemagenic Activities, Direct Instruction, and Behavior Analysis. The Southwest Educational Development Laboratory (SEDL) model is a bilingual approach first developed for classrooms in which 75 percent of the pupils are Spanish-speaking, but it can be adapted by local school staffs for other population mixes. In all cases the model emphasizes language as the main tool for dealing with environment, expressing feelings, and acquiring skills, including nonlinguistic skills. Pride in cultural background, facility and literacy in both the native language and English, and a high frequency of “success” experiences are all central objectives. The SEDL is a good example to show how difficult it is to compare the sponsors; in this case rather than forming a complete curriculum, the emphasis of SEDL is on helping Spanish speakers with a sensitive and multicultural approach. The goals were not to gain basic skills in arithmetic, oral skills are emphasized over written, and based on the target sample there was a higher difficulty set on improving reading. 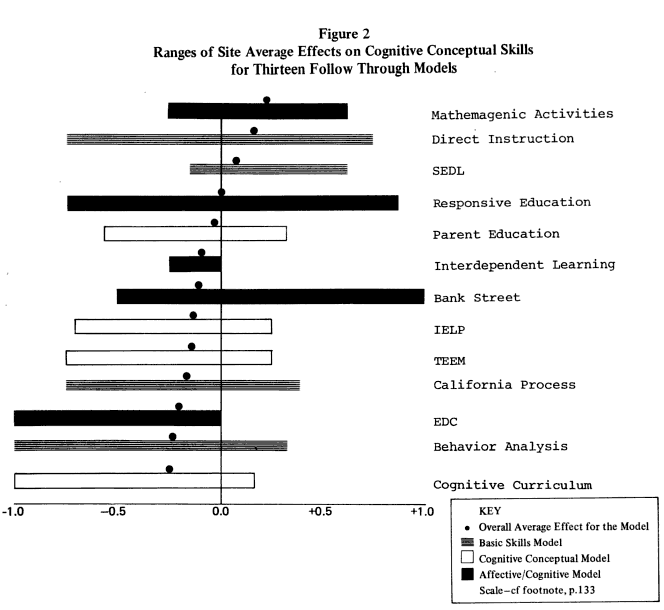 Given these factors, the result (smaller effect on basic skills, larger effect on cognitive and affective development) seems to be not surprising at all. This sponsor perhaps makes it clearest that Follow Through started as a social service program, not an education program. A fundamental principle of the BOPTA model is that parents and school personnel can, and want to, increase their ability to help their children learn. Also, parents and school personnel together can be more effective than either can alone. The sponsor’s goal is to assist both school and home to develop better child helping skills and ways to implement these skills cooperatively and systematically. These child helping skills are derived from careful study of child development, learning, and instructional theory, research, and practice. The, approach is systematically eclectic and features both diagnostic sequential instruction and child-initiated discovery learning. The results from the data for this program were roughly around average; basic skills did slightly better than cognitive skills. However, the idea of including home visits training makes a much different set of variables than just training the teacher. A parent aide program, an adult education program, and a cultural and extra-curricular program are the principal elements of this model. The model aims to change early childhood education by changing parent, teacher, administrator, and child attitudes toward their roles in the education process. It is believed this can be done by motivating the home and school to work as equal partners in creating an environment that supports and encourages learning. The instructional component of this program is in disarray. Since there is no in-class instructional model, teachers are on their own. Some are good, but in too many classes bored children and punitive teachers were observed. This sponsor ran what most people would consider closest to a modern “discovery” curriculum. The MAP model emphasizes a scientific approach to learning based on teaching the child to make a coherent interpretation of reality. It adheres to the Piagetian perspective that cognitive and affective development are products of interactions between the child and the environment. It is not sufficient that the child merely copy his environment; he must be allowed to make his own interpretations in terms of his own level of development. An activity-based curriculum is essential to this model since it postulates active manipulation, and interaction with the environment as the basis for learning. Individual and group tasks are structured to allow each child to involve himself in them at physical and social as well as intellectual levels of his being. Concrete materials are presented in a manner that permits him to experiment and discover problem solutions in a variety of ways. The classroom is arranged to allow several groups of children to be engaged simultaneously in similar or different activities. Teachers’ manuals including both recommended teaching procedure and detailed lesson plans for eight curriculum areas (K-3) are provided in the model. Learning materials also include educational games children can use without supervision in small groups or by themselves. Art, music, and physical education are considered mathemagenic activities of equal importance to language, mathematics, science, and social studies. MAP did the best of all the sponsors at cognitive skills and merely over baseline on basic skills. In the mid-1960’s, Rothkopf (1965, 1966), investigating the effects of questions placed into text passages, coined the term mathemagenic, meaning “to give birth to learning.” His intention was to highlight the fact that it is something that learners do in processing (thinking about) learning material that causes learning and long-term retention of the learning material. When learners are faced with learning materials, their attention to that learning material deteriorates with time. However, as Rothkopf (1982) illustrated, when the learning material is interspersed with questions on the material (even without answers), learners can maintain their attention at a relatively high level for long periods of time. The interspersed questions prompt learners to process the material in a manner that is more likely to give birth to learning. There’s probably going to be interest in this sponsor due to the obscurity and actual performance, but I don’t have a lot of specific details other than what I’ve quoted above because. It’s likely the teacher manual that was used during Follow Through is buried in a university library somewhere. This one’s often considered “the winner”, with positive outcomes on all three tests (although they did not get the top score on cognitive skills, at least it improved over baseline). What I find perhaps most interesting is that the model does not resemble what many think of as direct instruction today. Desired behaviors are systematically reinforced by praise and pleasurable activities, and unproductive or antisocial behavior is ignored. The “carrot rather than stick” approach reads like what currently labeled “progressive”. The extremely consistent control is currently labeled “conservative”. In the classroom there are three adults for every 25 to 30 children: a regular teacher and two full-time aides recruited from the Follow Through parent community. Working very closely with a group of 5 or 6 pupils at a time, each teacher and aide employs the programmed materials in combination with frequent and persistent reinforcing responses, applying remedial measures where necessary and proceeding only when the success of each child with a given instructional unit is demonstrated. The ratio here is not 1 teacher lecturing to 30 students. It is 1 to 5. Emphasis is placed on learning the general case, i.e., developing intelligent behavior, rather than on rote behavior. While the teacher explains first, the teacher is not giving mute examples. They are trying to make a coherent picture of mathematics. Before presenting the remaining addition facts, the teacher shows how the facts fit together–that they are not an unrelated set of statements. Analogies teach that sets of numbers follow rules. Fact derivation is a method for figuring out an unknown fact working from a known fact. You don’t know what 2+5 equals, but you know that 2+2 equals 4; so you count. Then the children are taught a few facts each day so that the facts are memorized. This is the “counting on” mentioned explicitly in (for example) Common Core and possibly the source of the most contention in all Common Core debates. This differs from those who self-identify with “direct instruction” but insist on rote-first. a continuous progress tester to reach 150 to 200 children whose job it is to test the children on a 6 week cycle in each core area. Assessment happened quite frequently; it is not surprising, then, that students would do well on a standardized test compared with others when they were very used to the format. The behavior analysis model is based on the experimental analysis of behavior, which uses a token exchange system to provide precise, positive reinforcement of desired behavior. The tokens provide an immediate reward to the child for successfully completing a learning task. He can later exchange these tokens for an activity he particularly values, such as playing with blocks or listening to stories. Initial emphasis in the behavioral analysis classroom is on developing social and classroom skills, followed by increasing emphasis on the core subjects of reading, mathematics, and handwriting. The goal is to achieve a standard but still flexible pattern of instruction and learning that is both rapid and pleasurable. In the behavior analysis classroom, four adults work together as an instructional team. This includes a teacher who leads the team and assumes responsibility for the reading program, a full-time aide who concentrates on small group math instruction, and two project parent aides who attend to spelling, handwriting, and individual tutoring. a.) 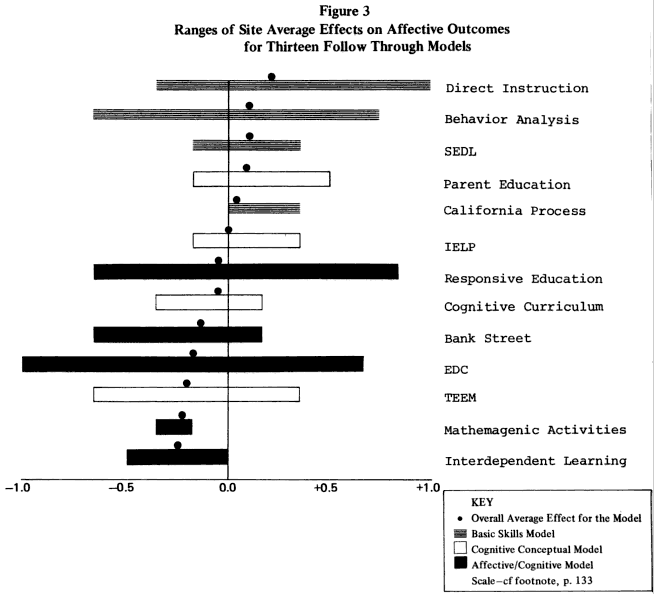 It often gets lumped with Direct Instruction (including in the original chart you’ll notice above), but links academic progress with play in a way generally not associated with direct instruction (the modern version would be the Preferred Activity Time of Fred Jones, but that’s linked more to classroom management than academic achievement). b.) It didn’t do very well — second to last in cognitive achievement, barely above baseline on basic skills — but I’ve seen charts claiming it had high performance. This is even given it appears to have included assessment as relentlessly as Direct Instruction. c.) It demonstrates (4 to a class!) how the model does not resemble a standard classroom. This is true for the models that involve a lot of teacher involvement, and in fact none of them seem comparable to a modern classroom (except perhaps Bank Street, which is a model that started in 1916 and is still in use; I’ll get to that model last). 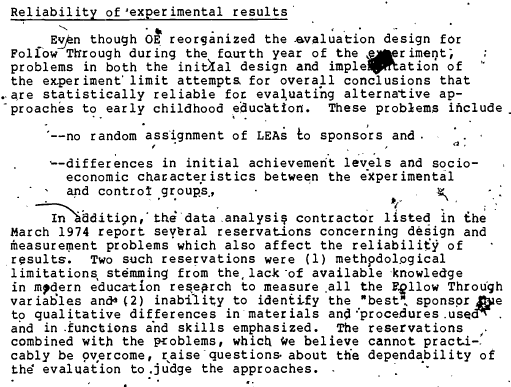 There was some back-and-forth criticizing the statistical methods when Education as Experimentation: A Planned Variation Model was published in 1977. Quite a few papers were written 1978 and 1981 or so, and a good summary of the critiques are at this article which claims a.) models were combined that were inappropriate to combine (I agree with that, but I’m not even considering the combined data) b.) Questionable statistics were used (particularly getting fussy about reliance on analysis of covariance) and c.) the test favored particular specific learnings (so if a class was strong in, say, handwriting, that was not accounted for). The “data analysis contractor” mentioned presenting reservations are the same Abt Publications that came out with the 1977 report. Another result of most LEAs not being restricted in their choice of approaches is that some sponsors were associated with only a few projects. The evaluation design for cohort three–the one OE plans to rely most heavily on to determine model effectiveness–requires that a sponsor be working with at least five projects where adequate testing had been done to be compared with other sponsors. Only 7 of the 22 sponsors met that requirement. In an effort to adjust for the initial differences, the data analysis contractor used a statistical technique known as the analysis of covariance … however, the contractor reported that the Follow Through data failed to meet some requirements believed necessary for this technique to be an effective adjustment device. 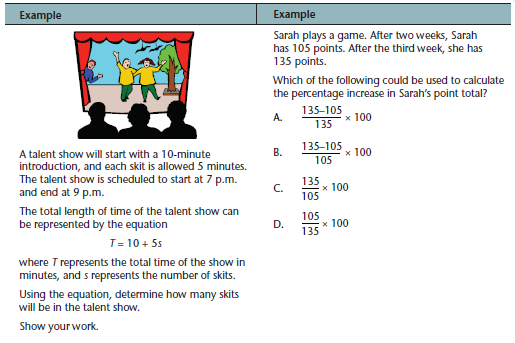 Further, no known statistical technique can fully compensate for initial differences on such items as pretest scores and socioeconomic characteristics. 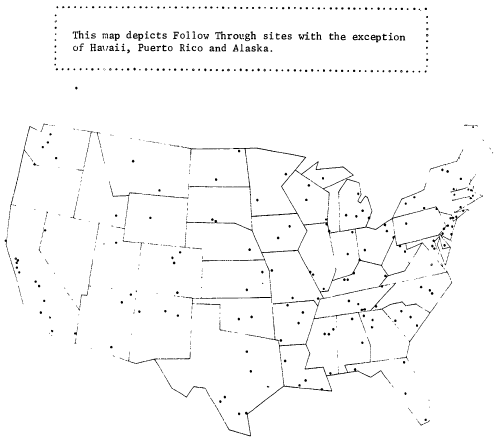 Accordingly, as OE states in its June 1974 summary, “the basis for determining the effects of various Follow Through models is not perfect.” Our review of the March 1974 report indicated that, for at least four sponsors, the adjustments were rather extensive. Included among the four is the only sponsor that produced significant differences on all four academic measures and the only two sponsors that produced any academic results significantly below their non-Follow-Through counterparts. 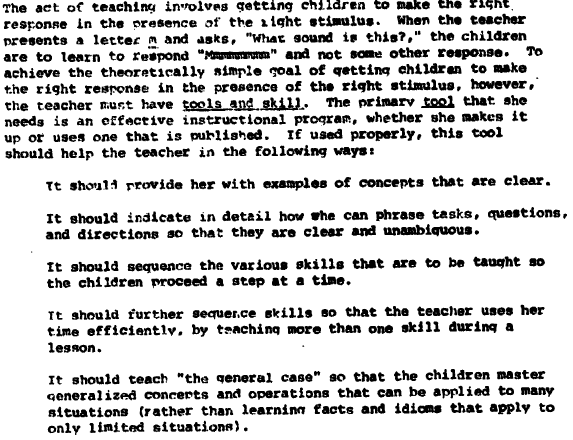 This issue was noted as early as 1973, calling out the High Scope, Direct Instruction, and the Behavior Analysis models specifically. Substantial analysis problems were encountered with these project data due to non-equivalence of treatment and comparison groups. The extreme data issues with Follow Through may be part of the reason why quasi-experiments are more popular now (taking some natural comparison between equivalent schools and adjusting for all the factors via statistics). When the National Mathematics Advisory Panel tried to locate randomized controlled studies, their report in 2008 only found 8 that matched their criteria, and most of those studies only lasted a few days (the longest lasted a few weeks). a.) The “Direct Instruction” does not resemble the direct instruction of today. The “I do” – “now you do” pattern is certainly there, but it occurs in small groups and with general ideas presented up front like counting on and algebraic identities. “General rather than rote” is an explicit goal of the curriculum. The original set up of a teacher only handling five students at a time with two aides is not a comparable environment to the modern classroom. b.) The group that made the final report complained about the inadequacy of the data. They had misgivings about the very statistical method they used. The Comptroller of the United States in charge of auditing finances felt that the entire project was a disaster. c.) Because the project was shifted from a social service project to an experimental project, not all the sponsors were able to handle a full educational program. At least one of the sponsors had no in-class curriculum at all and merely experimented with parental intervention. The University of Oregon frankly ran their program very efficiently and had no such issue; this lends to a comparison of perhaps administrative competence but not necessarily curricular outlook. 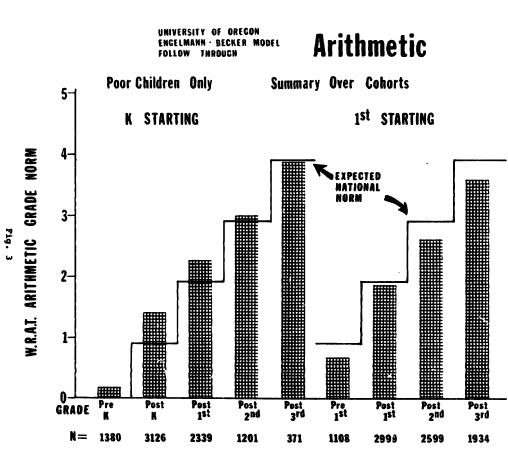 For instance, the U of O’s interim report from 1973 noted that arithmetic skills were no better than average in the early cohorts, so adjusted their curriculum accordingly. d.) While Direct Instruction did best in basic skills, on the cognitive measures the model that did best was a discovery-related. Based on descriptions of all the models Mathemagenic perhaps the closest to what a modern teacher thinks of as an inquiry curriculum. e.) Testing was relentless enough in Direct Instruction they had an employee specifically dedicated to that task, while some models (like Bank Street) did no formal testing at all during the year. 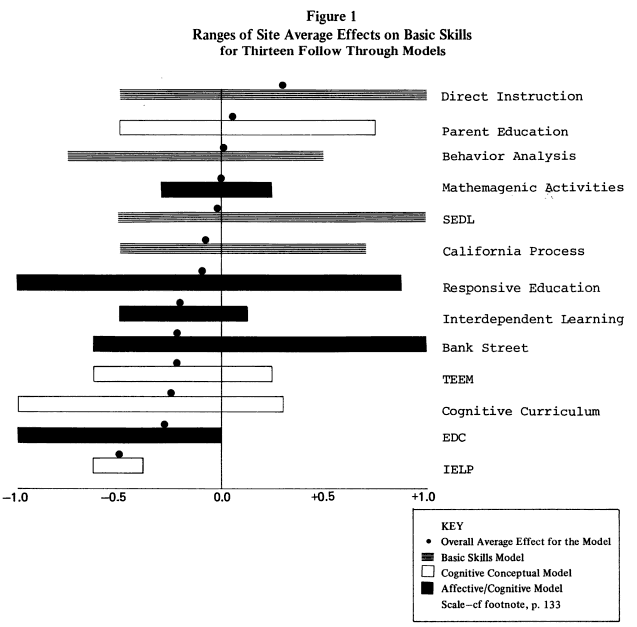 Of the two other models noted in the report as being in the same type as Direct Instruction, Behavior Analysis did not do well academically at all and the Southwest Educational Development Laboratory emphasis on language and “pride in cultural background” strikes a very different attitude than the controlled environment of Direct Instruction’s behaviorism. Before leaving, let’s hear from one of the groups that did not perform so well, but was (according to reports) well managed: Bank Street. In this model academic skills are acquired within a broad context of planned activities that provide appropriate ways of expressing and organizing children’s interests in the themes of home and school, and gradually extend these interests to the larger community. The classroom is organized into work areas fine; with stimulating materials that allow a wide variety of motor and sensory experiences, as well as opportunities for independent investigation in cognitive areas and for interpreting experience through creative media such as dramatic play, music, and art. Teachers and paraprofessionals working as a team surround the chidren with language that they learn as a useful, pleasurable tool. Math, too,is highly functional and pervades the curriculum. The focus is on tasks that are satisfying in terms of the child’s own goals and productive for his cognitive and affective development. Bank Street is still around and has been for nearly 100 years. 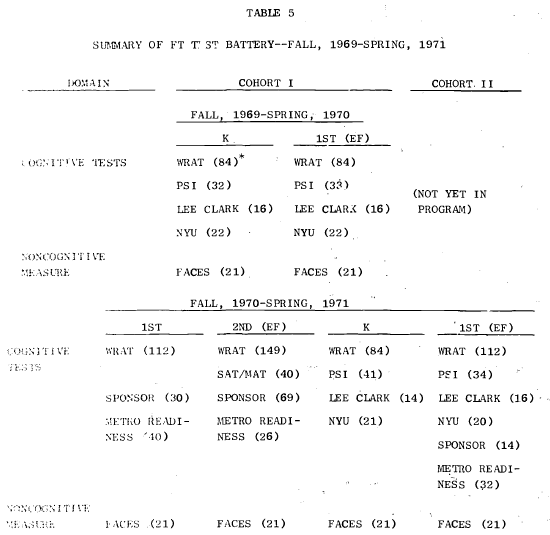 While their own performance tests came out positive, they did not do well on any of the measures from Abt’s 1977 report. The concepts of education we hold today are but variations of the fundamental questions that have been before is since the origins of consciousness. Socrates understood education as “discourse”, a guidepost in the search for wisdom. He valued inquiry and intuition. In contrast, Plato conceived of the State as the repository of wisdom and the overseer of all human affairs, including education. He was the first manager. As so has it always evolved: Dionysian or Apollonian, romanticism or classicism, humanism or behaviorism. All such concepts are aspects of one another. They contribute to evolutionary balance. They allow for alternative resolutions to the same dilemmas and they foster evolutionary change. Thus, a model is not a fixed reality immobilized in time. It is, as described above, a system, an opportunity to structure and investigate a particular modality, to be influenced by it and to change it by entering into its methods. The Bank Street model does not exist as a child-centered, humanistic, experientially-based approach standing clearly in opposition to teacher-centered, behaviorist modalities. These polarities serve more to define the perceived problem than they do to describe themselves. So based on my last post about Canada’s math wars I had a number of people stop to comment about direct instruction in general, including Robert Craigen who kindly linked to the PCAP (Pan-Canadian Assessment Program). 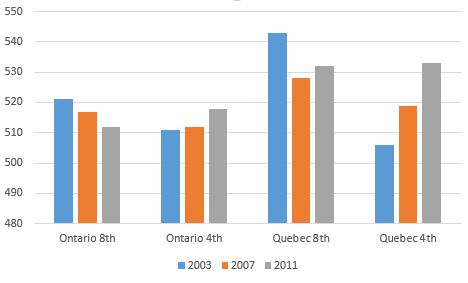 For PCAP 2010, close to 32,000 Grade 8 students from 1,600 schools across the country were tested. Math was the major focus of the assessment. Math performance levels were developed in consultation with independent experts in education and assessment, and align broadly with internationally accepted practice. Science and reading were also assessed. The PCAP assessment is not tied to the curriculum of a particular province or territory but is instead a fair measurement of students’ abilities to use their learning skills to solve real-life situations. It measures learning outcomes; it does not attempt to assess approaches to learning. Classrooms that used direct instruction achieved higher scores than those who did not. Teachers at public schools with less poverty are more likely to use a direct instruction curriculum than those who teach at high-poverty schools, even if they are given some kind of mandate. This happened in my own district, where we recently adopted a discovery-based textbook. There was major backlash at the school with the least poverty. This seemed to happen (based on my conversations with the department head there) because the parents are very involved and conservative about instruction, and there’s understandably less desire amongst the teachers to mess with something that appears to work just fine. Whereas with schools having more students of poverty, teachers who crave improvement are more willing to experiment. 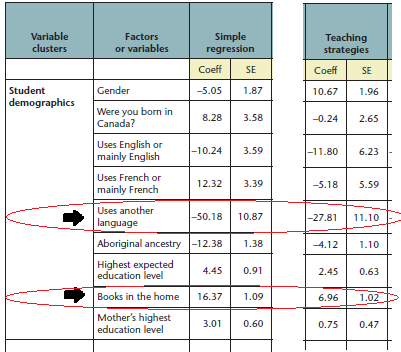 Lots of books in the home is positively correlated to high achievement on the PCAP (and in fact is the largest positive factor related to demographics) but also positively correlated to the use of direct instruction. Language learners are negatively correlated to achievement on the PCAP (moreso than any other factor in the entire study) but also negatively correlated to an extreme degree in the use of direct instruction. It thus looks like there’s at least some influence of a “more poverty means less achievement” gap creating the positive correlation with direct instruction. Now, the report still claims the instruction type is independently correlated with gains or losses (so that while the data above is a real effect, it doesn’t account for everything). However, there’s one other highly fishy thing about the chart above that makes me wonder if the data was accurately gathered at all: the first line. It’s cryptic, but essentially: males were given direct instruction to a much higher degree than females. The correlation of 10.67 really ought to be close to 0; this indicates a wide error in data gathering. Hence, I’m wary of making any conclusion at all of the relative strength of different teaching styles on the basis of this report. Robert also mentioned Project Follow Through, which is a much larger study and is going to take me a while to get through; if anyone happens to have studies (pro or con) they’d like to link to in the comments it’d be appreciated. I honestly have no disposition for the data to go one way or the other; I do believe it quite possible a rigid “teaching to the test” direct instruction assault (which is what two of the groups in the study seemed to go for) will always beat another approach with a less monolithic focus. * a reciprocal is a fraction that has 1 on top. What are some other things our students unlearn? Which things are acceptable to teach initially in a way that will later be changed? When is unlearning problematic? It is tempting when hearing about student performance on an international or national test is to assume they measure some monolithic mathematical ability. 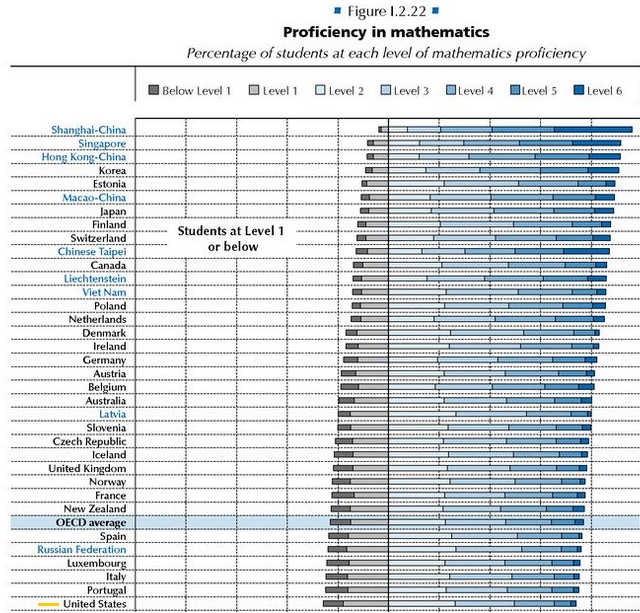 When a country is doing well on a test mathematical teaching is doing fine, and when a country is doing worse math teaching needs to be looked at and changed. Additionally, it is contended any countries that are doing well should have their strategies mimicked and any countries doing badly should have their strategies avoided. One issue with these thoughts is that the two major international tests — the TIMSS and PISA — measure rather different things. Whether a country is doing well or not may depend on what you think the goals of mathematics education are. You are asked to design a new set of coins. All coins will be circular and coloured silver, but of different diameters. · diameters of coins should not be smaller than 15 mm and not be larger than 45 mm. · given a coin, the diameter of the next coin must be at least 30% larger. · the minting machinery can only produce coins with diameters of a whole number of millimetres (e.g. 17 mm is allowed, 17.3 mm is not). Design a set of coins that satisfy the above requirements. You should start with a 15 mm coin and your set should contain as many coins as possible. A seal has to breathe even if it is asleep in the water. Martin observed a seal for one hour. At the start of his observation, the seal was at the surface and took a breath. It then dove to the bottom of the sea and started to sleep. From the bottom it slowly floated to the surface in 8 minutes and took a breath again. In three minutes it was back at the bottom of the sea again. Martin noticed that this whole process was a very regular one. What does the n stand for? A)The least of the three whole numbers. C) The greatest of the three whole numbers. D)The difference between the least and greatest of the three whole numbers. Which of these is equal to y^3? To mix a certain color of paint, Alana combines 5 liters of red paint, 2 liters of blue paint, and 2 liters of yellow paint. What is the ratio of red paint to the total amount of paint? The PISA tries to measure problem-solving, while the TIMSS focuses on computational skills. This would all be a moot point if countries who did well on one test did well on the other but this is not always the case. The mathematics skills of new engineering students have been systematically tested during years 1999-2004 at Turku polytechnic using 20 mathematical problems. One example of poor knowledge of mathematics is the fact that only 35 percent of the 2400 tested students have been able to do an elementary problem where a fraction is subtracted from another fraction and the difference is divided by an integer. If one does not know how to handle fractions, one is not able to know algebra, which uses the same mathematical rules. Algebra is a very important field of mathematics in engineering studies. It was not properly tested in the PISA study. Finnish basic school pupils have not done well in many comparative tests in algebra (IEA 1981, Kassel 1994-96, TIMSS 1999). That is, despite the apparently objective measure of picking some test or another as a comparison, doing so asks the question: what’s our goal in mathematics education? In most education literature I have seen going from concrete to abstract concepts as a ladder. The metaphor has always started with concrete objects before “ascending the ladder” to abstract ideas. I was researching something for a different (as yet unrevealed) project when I came across the following. That is, someone used the same metaphor but reversed the ladder. Children then learn to use an uppercase letter to represent a quantitative property of an object, and to represent equality and inequality relationships with the signs =, ≠, >, and B, or A<B. There is no reference to numbers during this work: “A” represents the unmeasured length of the board. 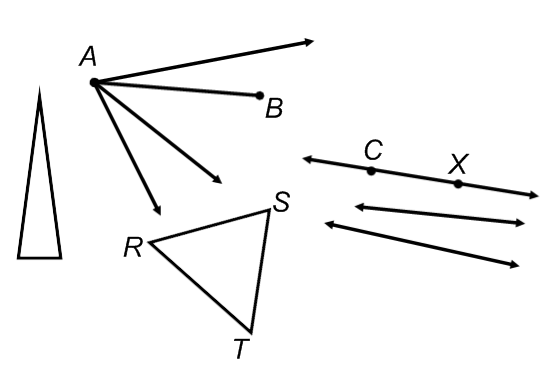 A later exercise takes a board A and a board B which combine in length to make a board C, then have the students make statements like “A + B = C” and “C – B = A”. Number is eventually developed as a matter of comparing quantities. A small strip D might need to be used six times to make the length of a large strip E, giving the equation 6D = E and the idea that number results from repetition of a unit. This later presents a natural segue into the number line and fractional quantities. I found curious the assertion that somehow students were starting with abstract objects working their way to concrete ones. (The typical ladder metaphor is so ingrained in my head I originally typed “building their way down” in the previous sentence.) The students are, after all, handling boards; they may be simply comparing them and not attaching numbers. They give them letters like A and B, sure, but in a way that’s no less abstract than naming other things in the world. After enough study I realized the curriculum was doing something clever without the creators being aware of it: they were presenting situations that (for the mind) were concrete and abstract at the same time. For a mathematician’s perspective, this is impossible to do, but the world of mental models works differently. By handling a multitude of boards without numbers and sorting them as larger and smaller, an exact parallel is set up with the comparison of variables that are unknown numbers. Indeterminate lengths work functionally identical to indeterminate number. This sort of thing doesn’t seem universally possible; it’s in this unique instance the abstract piggybacks off the concrete so nicely. Still it may be possible to hack it in: for my Q*Bert Teaches the Binomial Theorem video I used a split-screen trick of presenting concrete and abstract simultaneously. Although the sequence in the video gave the concrete example first, one could easily imagine the concrete being conjoined with an abstract example cold, without prior notice.